I love guest posts. I even like to give new bloggers a chance. I know it can be tough to earn guest blogging opportunities on fairly high profile blogs. And it is getting harder by the day. There are many blogs who no longer accept guest posts without any personal connection of the contributor to the blog owner(s). We have so far had a quite open guest posting strategy. We want to give new bloggers a chance. But I admit that I have been ignoring or turning down more and more guest post submissions that we get. 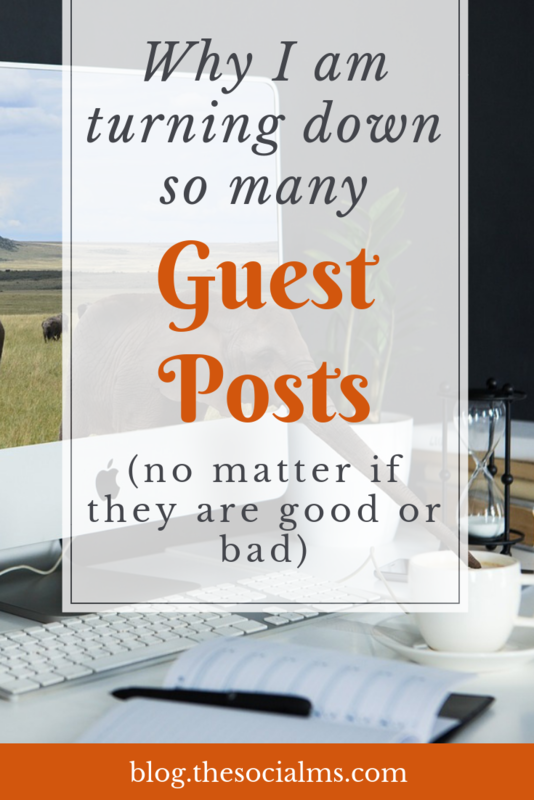 And here are my main reasons why I don’t even bother to respond to many of the guest post requests. Just yesterday I received a guest post request from an SEO agency. They provided some links to high profile outlets as a reference of the good work they supposedly do. And the first of the links I opened, linked to an article by a content marketing colleague that we personally know. We know that he does not work for this agency – but to make sure that he does not have a new job we simply asked him. Guess what his answer was? He had never heard of that agency and no he was certainly not writing for them. And this is only one small example of open or not so open lies that people use to get published. And I ask you what there is not to understand about that? And can you explain, why I still get so many article submissions with around 500 words – or even less. And claiming that the article with 500 words would so thoroughly cover the topic there simply is nothing more to write about is not helping either. Because, either your choice of the topic was not good enough because there is obviously not enough to write about. Or you simply do not know enough about the topic. Whatever it is, that is not what we are going to publish on our blog. I have had people claim they are the owner of a blog they are not even associated with. I have had people sending me references to articles written by anybody but the person emailing me. I have had people claim they were writing for a programming agency and the website of the agency looked as if programmed by my 11-year-old nephew. If I get the slightest notion that you are not who you claim to be, I am not going to publish your content. If you want to get published as a guest author on our blog: Don’t write with SEO on your mind. No sane blogger will accept a blog post for publication that is poorly written but contains multiple links that don’t add value. I have a blog audience to think about – I don’t care about your link-building strategy. If you cannot fit your link into the article where it makes sense – don’t. You can still link back in your author bio. We are running a marketing blog. So why do people bother to send me posts about finance, beds and other furniture, real estate, tech gadgets, dogs, self-care, alcoholism and drugs and anything else you can think off? Do you really think we could even consider publishing it? Or do you just not care? What happens if you write me an email that starts like that? Why? Because, really: if you can’t be bothered to research who you are writing to, then I won’t be bothered to answer. Yes, I am aware that the above names most likely are some copy and paste mistakes – but hey, it is your job to inspire trust, and calling me names is not the best way to achieve that. The Social Ms is a marketing blog. And while we do not claim that we are experts about just any topic in the field of online marketing the blog has a clear focus. To be honest, sending me references that cover dog training, gardening, adventure sports or whatever else you can think off, may simply not be the best to make me believe that you are an expert marketer. You may be a prolific and skilled writer – but what we are looking for are not posts that anyone who can write some decent text can just put together from reading other people’s expertise. Ok, I get it. You write your guest posts for link-building. I don’t care: If the post is outstanding and if all links in the article are legit that is totally ok. Some blogs will NOT accept any links back to the author’s website within the content. I do not necessarily mind if you link to your website from within the article if it makes sense. But not every article about marketing needs a link to an essay writing service. 10 Do I really check all that? Yes, I do. I click on every link you send as a reference. I check a post for plagiarism. I check who you are. I have seen too much stolen content, fake identities and shady links to not check it. I check every link in your content and shady links, unhelpful links, unnecessary links and links you clearly added for SEO purposes are a reason to turn you down. It is not your job to tell me how beneficial guest blogging would be for our blog. I know that. You need to convince me that publishing an article that YOU WROTE could be beneficial. Because what I do not know is who you are and why you should be a great author for our blog. Now, I have written about a lot of stuff that I do not like in contact letters for guest post applications. But what am I looking for? You need to inspire trust! Honesty is often a good start. I would much rather publish a guest post from a new blogger that I have not met before and who has not done any guest posting on any major outlet if the new blog looks legit and the email is honest. I would much rather get your own personal blog as a reference as a link to a Forbes article that you clearly have NOT written. If you are new to the blogging game? So what. It is nothing to be ashamed of. We have all been new to the game at one point. I do not know why so few people actually tell me who they are – and I don’t mean the name. Who are you working for? Where are you publishing other than guest posting? Are you a blogger? Which is your blog? What is your story? You do not need to write more than a sentence. But that would help a lot to show that you are legit. Because: my guess is that around 80% of the guest blogging requests we get are NOT from real people anyway. 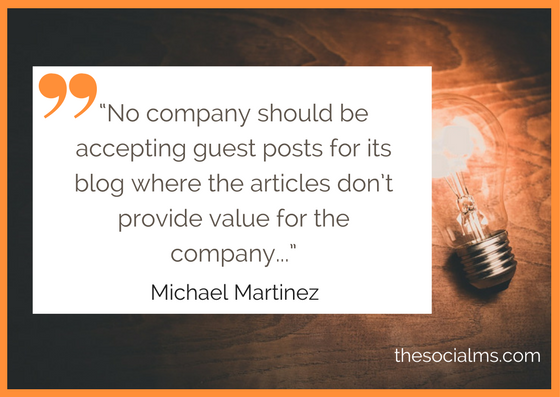 I know that many blogs will not accept guest posts requests from people they do not know personally anymore. I am not there yet. But the way people are treating us in their guest blogging requests, I may get there sooner or later. Are you aware of the immense power of guest blogging? 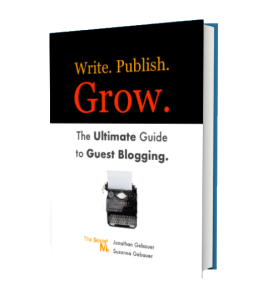 Do you want to use the power of guest blogging to grow your blog or business? We can teach you how to find the best blogs from your niche to try for your guest posting and get your posts approved by relevant blogs. We show you how to use the author bio to get more out of your guest blogging efforts. We explain how to grow your social media audience, traffic and even your email list with a single guest post. Why do we know all that? Because we have grown two businesses with guest blogging. We have published guest posts on various blogs from small niche blogs to major outlets like Social Media Examiner and Jeff Bullas’ blog.